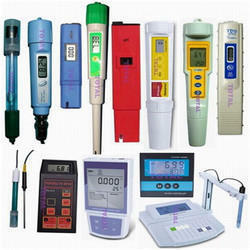 Providing you the best range of ph benchtop meters, pocket ph meter, ph bench meter, ph 600 meter, pocket ph tester and portable ph meters with effective & timely delivery. The HI 3512 is a 2 channel professional benchtop meter with a graphic LCD, designed to provide accurate laboratory results. Channel 1 features pH/ORP/ISE and temperature measurement capability while channel 2 measures EC/TDS/NaCl/Resistivity and temperature. 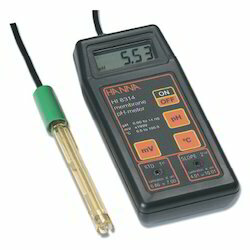 HANNA’s HI 3220, HI 3221 and HI 3222 benchtop instruments feature up to five point pH calibration with a choice of five custom buffers and seven standard buffers. Simple to use Large LCD Economical. Battery Type/Life: (4) 1.5V (included) / approx. Dimensions: 175 x 41 x 23 mm. Supplied with protective cap, calibration screwdriver, batteries and instructions. 0.001 pH resolution Stability indicator Store and recall data Display primary reading and temperature simultaneously 1 or 2 point automatic calibration with buffer recognition. PC Connection: RS-232 serial port. Environment: 0 to 50°C (32 to 122°F); RH max 95% . pH 213 is supplied with pH electrode, temperature probe, HI 76404N electrode holder, pH 4.01 & 7.01 buffer solutions (20 mL each), HI 7071S electrolyte solution, power adapter and instructions. Temperature Compensation Environment:0 to 50°C / 32 to 122°F; max RH 95% Battery Type. 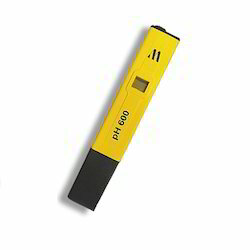 Dimensions / Weight: 150 x 30 x 24 mm / 85 g.
We hold expertise in offering a premium array of Pocket pH Tester, which is highly used in Industries, Research Institutions, Laboratories, Power Plants and also in schools, pools, salt/freshwater aquariums, gardening and all other water applicable areas. Our range can be availed at market leading prices as per the specifications provided by our clients. 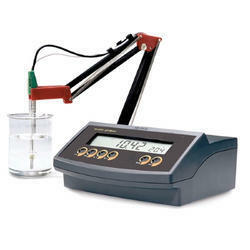 Furthermore, meters give fast and accurate readings on a large and easy to read LCD. Optimum quality, Handy & easy to use,Fast and accurate readings,Lightweight & pocket-sized, Long lasting, Calibration is simple, Single & Multi Point calibration.Screwdriver included to turn the trimmer screw. Oil industry, Chemical industry,Pharmaceutical industry, Petroleum industry,Industrial usages,Scientific instruments & lab equipments,Measuring equipment. 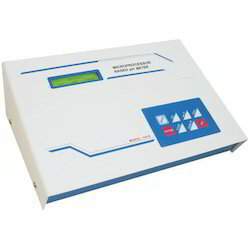 Plastic carry case along with user's manual, Other Specifications:- A. T. C. Automatic cal LCD with two displays & bar graph indicator.Data hold, 100 point data logger. Features of Analog pH Benchtop Meter:-Simple to operate, Manual calibration,Manual Temperature Compensation (MTC), Economical The pH 209 benchtop pH meter is designed for durability and simplicity of use. 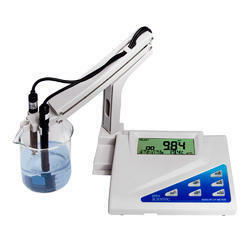 This instrument features a large, easy to read LCD and user friendly dials. 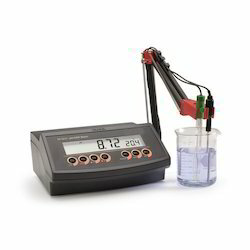 The pH calibration is manual at one or two points using dials on the front panel making them ideal for applications that require custom calibration points. In many applications, a standard calibration curve such as pH 7 or pH 4 is too far from the value of the sample to achieve the highest accuracy. Manual calibration enables the user to select the instrument’s calibration points closer to the desired range of measurement to achieve maximum accuracy. The pH 209 can also measure ion concentration (ISE) or ORP (oxidation reduction potential) in the extended mV range with optional electrodes. Durability, simplicity and comprehensive operating procedures make this meter one of the most popular student pH meters available today. Battery Mains 232 pH Electrode P.O.R. 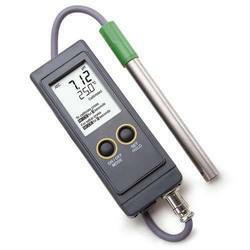 Looking for Ph Meter Portable and Ion Meter Portable ?